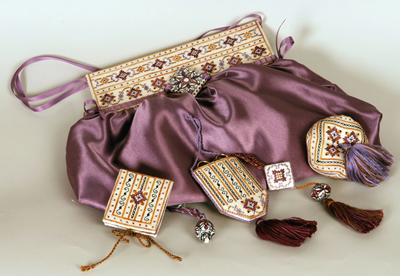 A lovely sewing purse with matching sewing accessories embroidered with the beautiful hand dyed threads of The Gentle Art . This is the eighth design of the series “Deruta by GPA” inspired by old majolica/pottery designs of Deruta art. Deruta is a beautiful old town of Umbria, Italy, full of history and art. We strongly advise you to pay a visit to this town. You’ll be enchanted…. Each majolica/pottery button and bead is unique since it is handmade and painted only for Giulia Punti Antichi. 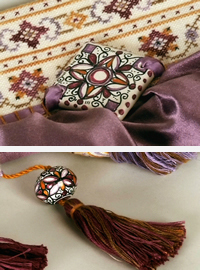 D8 Deruta majolica kit: Large square flat button (D8-LS) and medium Fuseruola (B8-MF) . Please ask our Company if you wish to purchase these accessories. light-purple silk finishing fabric, strong ecru cotton fabric, interfacing, Skirtex, Iron On Adhesive, quilt cotton batting, ecru wool felt, light-purple polyester ribbon ¼ in / 6 mm wide, matching polyester sewing thread, fiberfill, acid free stick glue, Tacky Glue or fabric glue, lightweight acid free cardboard. – a wonderful Deruta large teardrop Fuseruola (D8-TD), matching with the D8 Deruta majolica kit, is available from Giulia Punti Antichi. It can be used as a pendant for a matching necklace or as a decoration for your purse. Chart pack includes designs charts and instructions for stitching and finishing the purse and the accessories. Stitches Cross stitch over two and over one, Back stitch over two and over one, laced cross stitch bars.